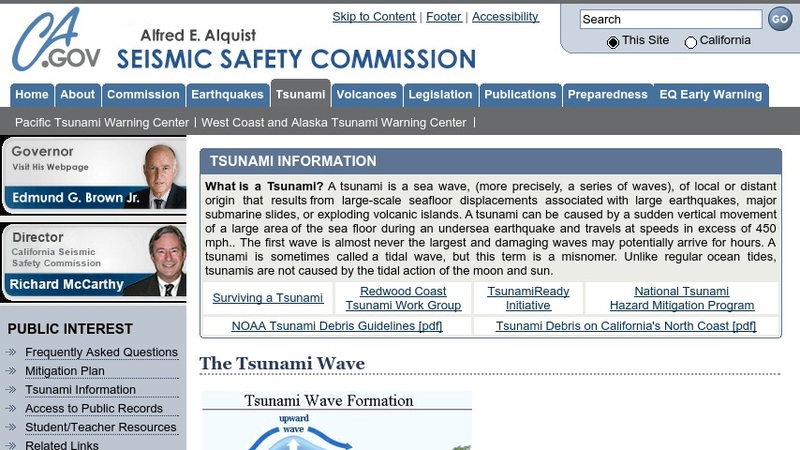 This page provides general information on tsunamis for the state of California and the Pacific coast. Topics include what tsunamis are and how they are generated, the tsunami generated by the 1964 Alaska earthquake, and steps individuals should take if they experience an earthquake at the shoreline or hear a tsunami warning. There is also a discussion of the Sumatra-Andaman earthquake of December 26, 2004 and an animation of the powerful tsunamis it generated, as well as a set of links to tsunami research organizations.